Liverpool were back to their frightening best ​as the Premier League leaders thumped Watford 5-0 at Anfield. After settling the quicker of the two sides, the Reds took the lead on nine minutes as Trent Alexander-Arnold's excellent cross was expertly headed home by Sadio Mane, before the two combined for Liverpool's second 11 minutes later, when the Senegalese international produced an impudent backheel finish to beat the onrushing Ben Foster. Mohamed Salah almost scored a third for Liverpool on 37 minutes, but saw his effort diverted onto the woodwork by Foster, while Watford's best moment of the half came three minutes before the interval, when Troy Deeney turned an opportunity wide from just eight yards out. The second half followed the same pattern of the opening 45 minutes, with Liverpool getting their third of the game on 66 minutes, as Divock Origi, who was drafted in to replace Roberto Firmino, drilled his effort beyond the reach of Foster. Two smart stops from Alisson denied substitute Andre Gray to stem any prospect of a Watford comeback in the 75th and 77th minute, before two Virgil van Dijk headers in the final 11 minutes of the game sealed an emphatic win for Jurgen Klopp's side. Following staunch criticism for their performance in the goalless draw against Manchester United, Liverpool produced a stunning reaction against Watford as they blitzed the visitors with a majestic five-goal display. There were impressive performances all over the pitch for the Reds, with Trent Alexander-Arnold and Andy Robertson producing all five assists on the night (3 and 2), while the likes of Fabinho, Virgil van Dijk, Sadio Mane and Mohamed Salah were on top form. Even Alisson, who had precious little to do over the course of the game, produced two important stops to prevent any notion of a comeback and secure another clean sheet, with Liverpool certainly showing their title-winning credentials with a stunning display. Starting XI: Alisson (7); Alexander-Arnold (9*), Matip (7), Van Dijk (8), Robertson (7); Wijnaldum (7), Fabinho (8), Milner (7); Salah (8), Mane (8), Origi (7). Substitutes: Henderson (6), Lallana (6), Keita (N/A). A number of players stood out for Liverpool, but Trent Alexander-Arnold had a great game at both ends of the pitch, with him being part of a backline that record their 16th league clean sheet of the season, while he registered three assists in the game, all coming from quality deliveries out wide. The England international will be a key player for the Reds in the remainder of the season, as his quality in wide areas gives Liverpool another avenue to attack from. Great ball Alexander-Arnold, great leap Mane. #LFC have the early goal they craved! Javi Gracia's side simply weren't at the races against the Premier League leaders, as the Reds' pace, energy and quality proved too much for the Hornets on the night. 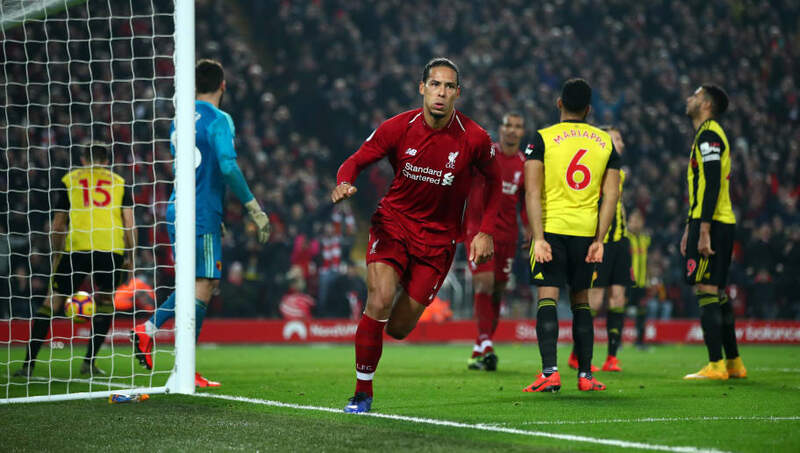 Watford entered the game in great form, winning three of their last four games in all competitions, although they came up against a Liverpool side with the bit between their teeth and a title to chase, although Watford's defending didn't exactly help. While there's no shame in taking a defeat at Anfield, Gracia will hope it's only a blip, as he looks to guide Watford to seventh place in the Premier League come the end of the season. Starting XI: Foster (5); Janmaat (4), Mariappa (5), Cathcart (5), Masina (4); Hughes (5), Doucoure (5), Capoue (5), Pereyra (4); Deulofeu (5), Deeney (5). Substitutes: Gray (6), Cleverly (5), Sema (N/A). Although coming on with only 17 minutes remaining, Andre Gray actually caused Liverpool a few problems that his teammates couldn't, and had it not been for Alisson, could've instigated a late comeback. Liverpool will be full of confidence ahead of their next game, which is the Merseyside derby this Sunday at Goodison Park, before hosting Burnley the following week. Watford meanwhile will be hoping for better when they welcome Leicester City to Vicarage Road on Sunday for Brendan Rodgers' first game in charge of the Foxes.